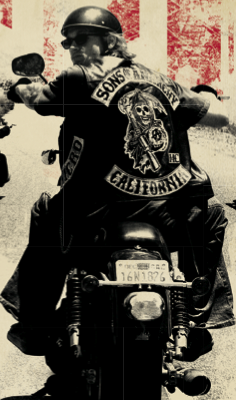 I previously blogged about media darlings back in May and wanted to provide an update about FX Networks attempt to immortalize outlaw motorcycle “clubs.” The “Sons of Anarchy” web site is now live and the FX Network TV show debut’s September 3rd. In big budget “Hollywood” fashion the FX Network marketing folks have gone all out on this site. John Landgraf (President and GM FX, FX HD, Fox Movie Channel and FX Productions) pulled out all the stops to fund this series. The site is jam packed with information on the show with background on cast & crew, a bike gallery, videos and trailer clips. They’ve added elements of social media in that viewers can participate via mobile or in a community discussion. The “board” already has a bunch of comments weighing in on the right to wear colors. I especially liked how they took liberties with and provided a “Biker Terms” section…I guess to help those who are unfamiliar with the biker culture or vernacular and help out any hang-arounds?! The show was originally called “Forever Sam Crow”, however, the litigation folks at Hells Angels caught wind of the pilot from Kurt Sutter (writer & director) who was in a Variety interview and noticed there were references to a specific Northern CA. motorcycle “club”…shortly after the interview hit the newswire they received a cease and desist notice from the same “club”. Something about copyright infringement so, the name of the TV show and club was changed.